The Knight of Pentacles tarot card represents expertise, reliability, and a solid work ethic. As the air aspect of earth, he has worked out a proven method of getting things done and delivering predictable results. The bright yellow sky in the Knight of Pentacles tarot card shows that he has put a lot of thought into it. From the large, neatly plowed field, you can tell that he knows the harvest will be bountiful. Living in a world where everything is going according to plan, his aspirations aren’t all that high. The mountains in the background of the Knight of Pentacles are not the tallest you’ve ever seen, but they’re green and fertile. His huge black plow horse symbolizes constancy and power. He isn’t planning on going anywhere fast. 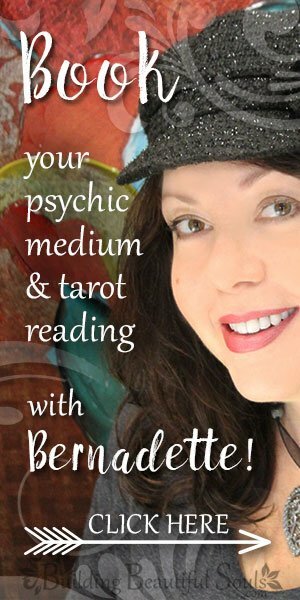 The Knight of Pentacles tarot card combines the energies of fiery Aries and Taurus. The Knight of Pentacles is a straight shooter, passionate but stubborn. As the two black silhouettes of the trees of knowledge and life show, his philosophy is simple. But his moral universe is black and white. There are no grey areas. The Knight of Pentacles likes things to be just the way they are, and he doesn’t care much for change. Flexibility is not his strong suit. Apart from his success, the Knight’s reputation means everything to him. He is proud, but not vain. The Knight of Pentacles is clearly not the flashiest dresser in the tarot. He has adorned himself with tokens of strength and success. In the Knight of Pentacles tarot card, the Knight’s helmet and the head of his horse are plumed with oak leaves, symbols of strength. His armor is plain, but undented and brightly polished. This knight has obviously not seen much combat. But the Knight could probably stop any intended mischief with a mean glare and a sharp word. Seated on his mount, he presents a single pentacle, a sign of his wealth, like a business card. It’s hard to imagine a better card for any business situation than the Knight of Pentacles. 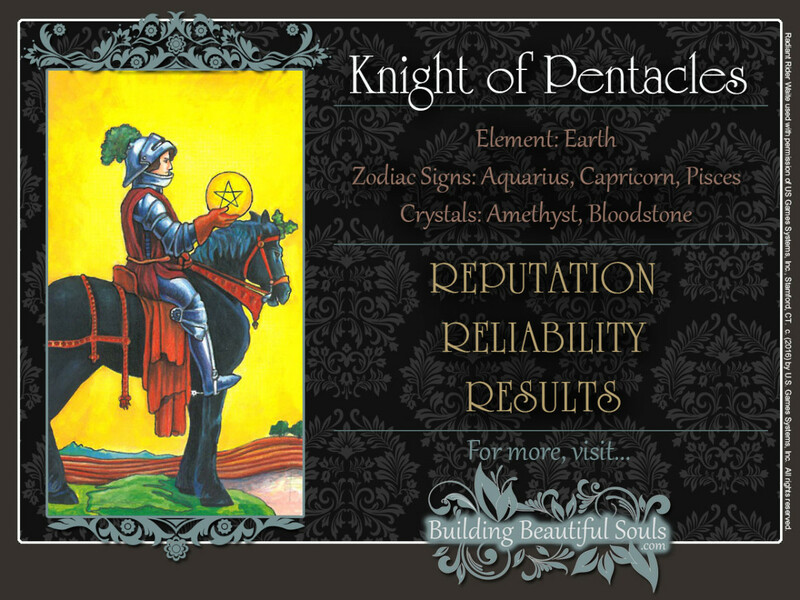 The Knight of Pentacles is all about reputation, reliability, and results. Your approach to getting the word out may not be flashy, but it’s earning you a reputation of being an “honest Joe.” Others know that they can count on you, and they’re telling everyone who’ll listen. Your business plan is unfolding exactly as you have predicted. Your financial picture improving at a steady, predictable pace, and wise planning will only make things better. If the Knight of Pentacles card represents another person, you are have met someone who is hardworking, responsible, and reliable. You won’t find a better auto mechanic, for example. He or she will tell you exactly what’s wrong with the car, how long it will take to fix it, repair it on time – and all at a good price. There will be no surprise news about some worn out whatchamacallit-widget he’ll need to replace at half the cost of what you actually paid for the car. If this is a new customer or client, do your utmost to keep this person happy. This is someone who pays the bills on time and will bring you lots of repeat business. In the romance department, the Knight of Pentacles may not be the most exciting person. If you’re looking for some well-dressed eye candy to strut around with in front of your BFFs at the local club scene, you probably won’t make it past the second date. But if you’re looking for a long term relationship with a grownup, this person is a very good catch. If you’re ready to settle down, you can look forward to a romance without games or unpleasant surprises. The Knight of Pentacles represents someone who is responsible, hardworking, faithful, and financially stable. Oh, and this person will expect the same of you. The Knight of Pentacles’ single mindedness makes him accomplish great things, but it can also be his downfall. Fasten your seat-belt and grit your teeth! There’s no jumping off until this ride is over. When fiery Aries goads stubborn Taurus into action, there’s no stopping whatever has been set into motion – for good or ill. If you’ve read the fine print and planned for all contingencies – even the most unlikely ones – you’re good to go. But at this point, there’s no turning back from whatever you have started. When the Knight of Pentacles tarot card is reversed, the universe cautions you to look before you leap. Everything must be in the place, and the timing must be just right. Hesitation and delay can be just as destructive as reckless action. The time to make sure your ducks are in a row was yesterday. Whether a business opportunity is too good to be true or a once in a lifetime chance depends on how well you have done your homework. Your gut feeling alone won’t be enough to go on. Here, the universe also challenges you to think outside the box. An unexpected event or an ongoing development you haven’t been paying enough attention to won’t allow you to continue doing thing the way you have been. It doesn’t matter, if this approach has worked for years. Things have changed, and you must find a way to adjust to this new situation. Your experience, smarts, and know-how will help you get through these changes. After all, they have gotten you to where you are now. As long as you are willing to go with the flow, you will still come out on top. In the tarot, the Knights are associated with the Number six. Kabbalistically, this number symbolizes the strength and life giving power of the sun. In traditional numerology, it is attributed to Venus and the power of love. The Knight of Pentacles represents the energy that gives life to the Earth, as well as a person who is bound to his native soil by strong ties of love.